This week the children have been fascinated by the weather. We've been holding science experiments in which we count how long frost takes to melt on our hands. 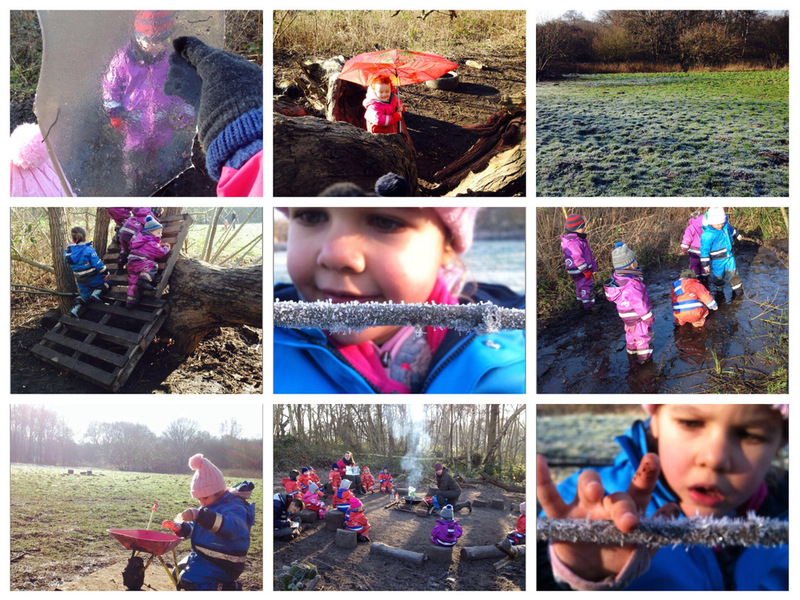 We've been experimenting with ice and frost melting in the sun, the shade, elevated, on the ground and any other combination of factors our children believe could change the rate with which ice melts......including trying putting it in a wheelbarrow! We love seeing their creative side inspired by play like this to learn all about science. Ice has been a great tool for fun and learning this week. In addition to our weather experiments, we've broken pieces of ice to create sculptures, we've jumped on ice to hear the satisfying crunch and we've monitored how cold it has to be before we find some fun ice to play with. We've then had some creative arts with painting on ice, painting on sticks and this week we also painted an umbrella then enjoyed taking turns to shelter under our personalised umbrella. Physical activity always plays a big part in our days and especially with the colder weather we've been encouraging lots of movement. We've been climbing, running...and also absolutely loved the pulley swing that caused laughs of delight from both the children and the practitioners. Now that our new children are starting to settle a little better we have been able to start introducing campfires again. We do have to be fully confident that our fires can be offered whilst maintaining high levels of safety for the children so we've had to take a few weeks off whilst we get to know our new children. Given the colder weather we are really pleased that we are getting closer to being able to start having fires again most days. Fires are such great learning opportunities for the children, teaching them about maths, about risk, about understanding the world, understanding their responsibilities.....and the fact that we usually have a toasted marshmallow is a bonus! Please can we remind you that during this colder weather it's extremely important to dress your children up warm. When they start to waddle a little from layers that's a pretty good indication that they are going to be toasty warm in the forest!